Crispy Roast Potatoes: not your traditional potato side dish! I am always looking for tasty potato recipes. Russets, Yukon Gold, baby reds, really doesn’t matter. If it’s a potato, I love it. So often the potato, or any side dish for that matter, is underrated and overlooked. Well this delicious crispy roast potatoes dish, while it might take a few more minutes to prepare, is definitely impressive and will not go unnoticed. 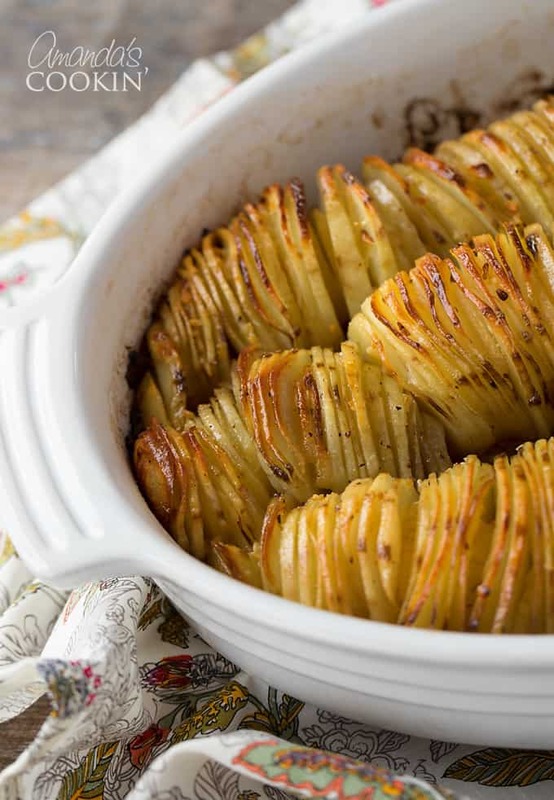 Similar to our Hasselback Potatoes, this potato recipe will be a hit with the family! These crispy roast potatoes make the perfect side dish to just about any dinner! 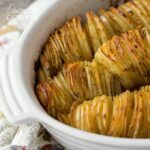 I found this Crispy Potato Roast on Susan’s blog, Eat Little, Eat Big and knew I wanted to give it a shot myself- it looked too good to pass up. All in all, these crispy roast potatoes came out marvelous! They are even awesome the next day. Pop some in the microwave for 30 seconds or so and enjoy. Totally delicious and tender. I only made minor changes. I had a little bit of homemade garlic butter left in the fridge, so I worked that in. I also changed the seasoning. Other than that, the recipe is the same. You can use just plain butter, I mixed in some garlic butter I had. Then I sliced the potatoes using a mandoline. I kept the potato slices together by placing them in a bowl until I was done with all of them. Brush the bottom of the casserole with a little of the melted butter. I took the ends of the potatoes and lined the bottom. Because my dish was very deep, I chose to stack some of the potato slices to raise the height a bit. Then arrange the slices on top, insert the shallots, brush with remaining butter and season. I will be making these crispy roast potatoes again, that’s for sure! Thanks for the great recipe Susan. This post was originally published on this blog on February 6, 2012. In a small bowl, combine melted butter and oil. Brush bottom of a casserole dish with some butter mixture. Cut the ends off the potatoes and set aside. 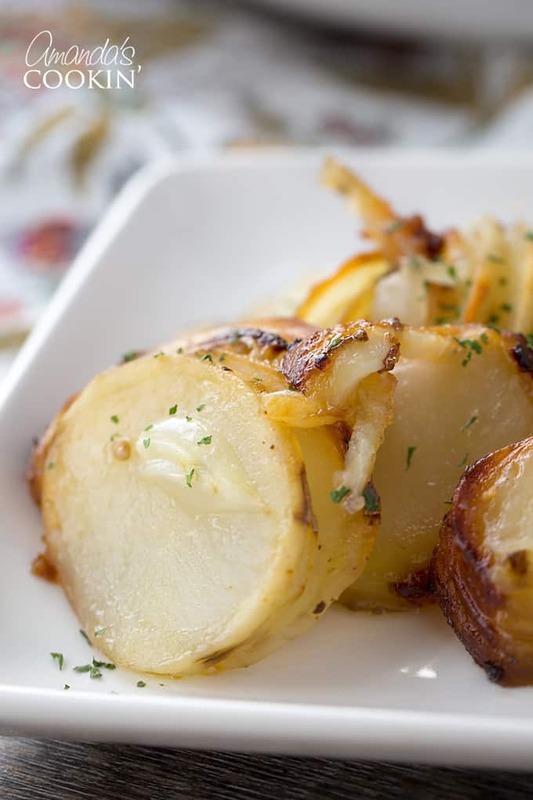 With a sharp knife or mandoline, slice potatoes very thinly crosswise. 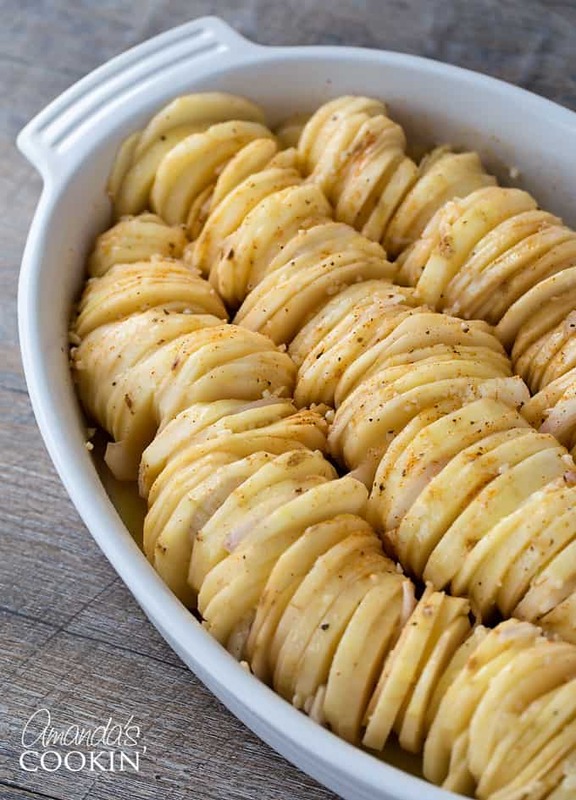 Fill bottom of casserole with the cut ends, then arrange potato slices vertically on top. 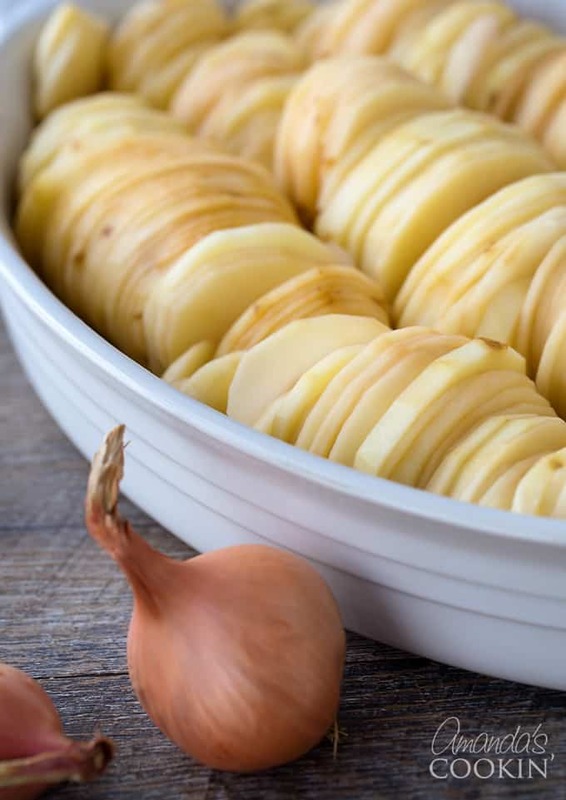 Wedge the shallots throughout the potatoes. Sprinkle with seasoning of choice and brush with remaining butter mixture. Bake 1 1/4 hours. If potatoes an shallots are getting too brown, tent with foil and bake another 15-20 minutes more, or until tender. How wonderful Lori, that sounds delicious!! Ooooh, this is so easy yet looks so impressive! I’m excited to try it! Thanks so much Mary! 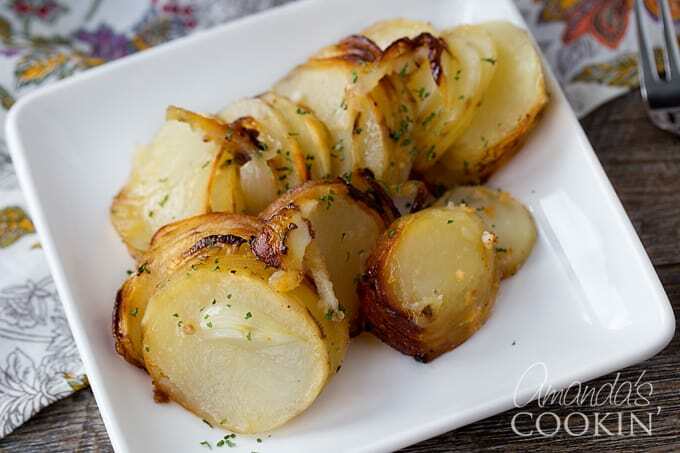 I LOVE those potatoes, they are even awesome heated up as leftovers. I’ve had them in the morning with eggs :) So glad you like the meatloaf too! 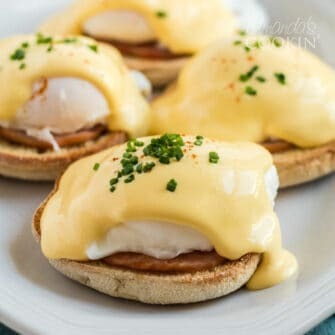 These would go great with any meal! Besides looking beautiful they sound delicious.